Celebration has an active ministry of hospitality. We are committed to receiving all as Christ. Visits of varying lengths and purpose may be scheduled. Our self-catering guesthouse has served both as a place of refreshment for our many friends and family members who visit and as a home-away-from-home for weary travelers from around the world. Conferences are a regular component of our work. Our teaching ministry spans a wide range of subjects from worship leadership to Christian education to liturgical renewal to prayer and Christian life. All of our conferences are characterized by lively discussion and active participation. View past conferences here. In contrast to the active engagement of a conference, we regularly receive those who are in need of some 'quiet time away,' on either private or directed retreats. 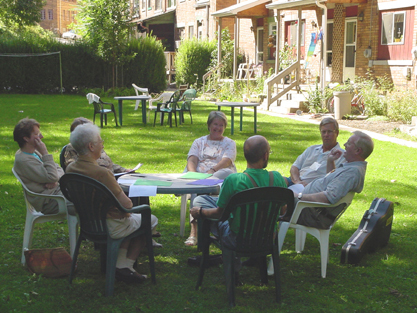 For information about individual and group retreats, check out our annual schedule.